Contents: Introduction; Lady Morgan; Anna Eliza Bray; Mary Wright Sewell; Mary Cowden Clarke; Louisa Twining; Marianne North; Mary Elizabeth Braddon; Anne Thackeray Ritchie; Frances Hodgson Burnett; Sarah Grand and Ménie Muriel Dowie; Emmeline Pankhurst; E. Nesbit; Mary Cholmondeley; Select bibliography; Index. Valerie Sanders is Professor of English at the University of Hull, UK. 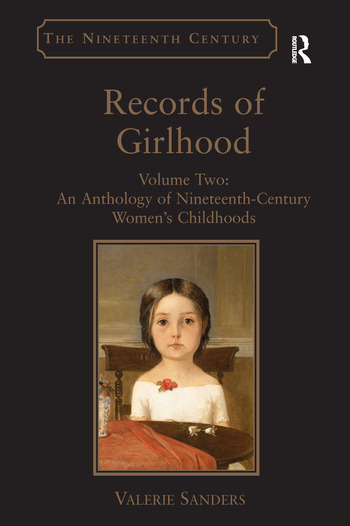 Previous publications include a first Records of Girlhood collection (2000), The Brother-Sister Culture in Nineteenth-Century Literature: From Austen to Woolf (2002), and The Tragi-Comedy of Victorian Fatherhood (2009). She is currently a contributor to Pickering and Chatto’s Selected Works of Margaret Oliphant.